Jweiland.net Review 2019: Is Jweiland.net a Good Hosting? Jweiland.net has hosted more than 36,000 domains for businesses in Germany and around the world. But this is not is typical web host since it specializes in hosting for the TYP03 open-source CMS. German web hosting company jweiland.net (Jochen Weiland) was founded in 2003. It specializes in shared and managed hosting solutions for the TYP03 open-source CMS backed by high-performance SSD servers in a German data center. It also provides web design services and has a superior technical support team. This hosting provider hosts over 36,000 domains for customers in Germany and beyond, and its website is in German. Jweiland.net’s servers are located in a high-security, high-performance data center in Germany. To ensure maximum bandwidth and reliability, the data center facilities include multi-redundant network connections linked to several carriers, plus a direct connection to the DE-CIX hub in Frankfurt. This vendor uses HP Enterprise servers equipped with SSD storage in a RAID configuration, which ensures fast website loading speeds. In addition, all the servers come with a 1 Gbit/s internet connection for fast transfer of large amounts of data. Customers’ website data is backed up daily, and in case of a data loss event, video tutorials show you how you can restore your data. There is no free SSL with jweiland.net’s hosting plans, but you can purchase an add-on SSL package for AlphaSSL or GlobalSign certificates. In addition to the paid hosting plans, I should also say that this provider also offers a free shared hosting package that comes with 10 GB SSD storage space, 20 databases, and 5 GB email storage. Jweiland.net’s specialist hosting plans are pretty pricey, but you get flexible monthly billing, a free domain, a 30-day money-back guarantee, and a 99.9% uptime guarantee. You can try before you buy, by taking up the free trial and development package that lasts up to three months. If you prefer to support yourself, you can take advantage of this vendors knowledge base and TYP03-related video tutorials. 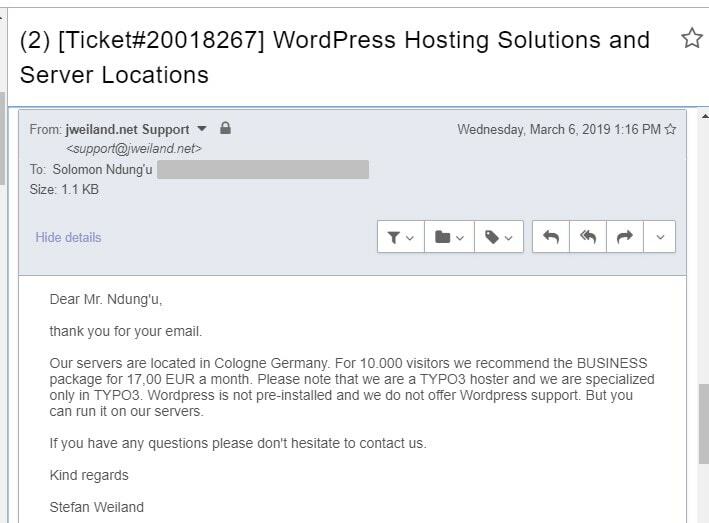 Jweiland.net has a lot going for it in terms of its superior support team and its use of 100% SSD servers, but you’re really only likely to host your website with this company if you want to take advantage of its TYP03 expertise. 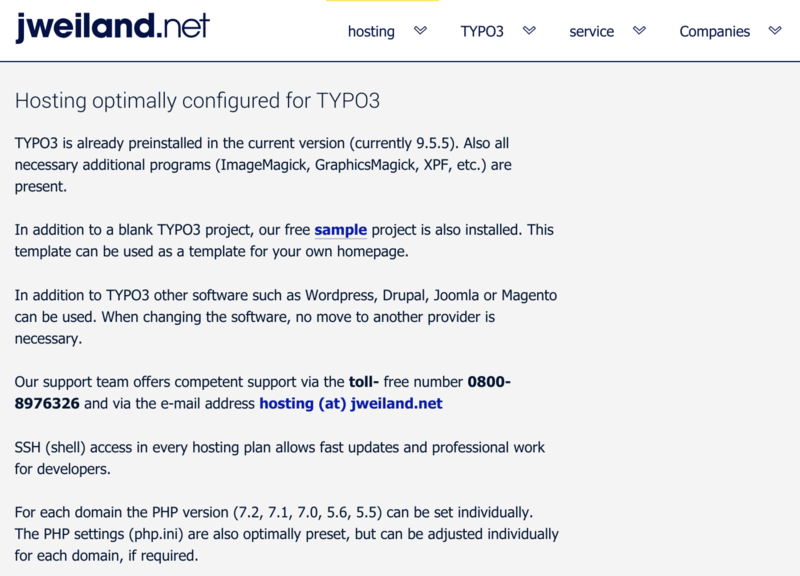 For TYP03 hosting, take a look at jweiland.net. Wondering how Jweiland.net stacks up against other Web Hosting companies? Enter any other Web Hosting company and we will give you a side-by-side comparison.